Cypher Media is a corporate communication service based in Droitwich Spa, Worcestershire. The company was established in 2003 by Managing Director, Adrian Worrall and Director, Brian Darnley to create cutting edge corporate communication tools and services. The company offer services including Corporate Video, Live Event support, e-Media solutions and web development. 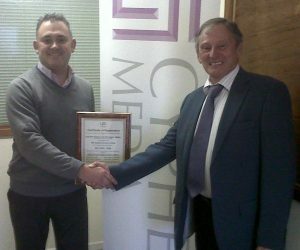 We have been working in partnership with Cypher Media since 2012, implementing and continually auditing their ISO 27001 Information Security System. We thought it would be a great opportunity to catch up with the team and see how the standard has matured and is still helping to improve the business. The ISO 27001 encompasses people, process and IT, giving the client complete confidence in the security of your services. Cypher Media first approached us because of what they identified as the business case for certification. The certification to the ISO 27001 meant they would be able to comply with their clients and tick “much needed boxes as a supplier”. The company wanted to make sure all communication, from clients to suppliers, was as secure as possible and the ISO 27001 fitted all of these needs. Managing Director, Adrian Worrall, described their client market as particularly “niche” and their business model is based on returning clients and establishing “long partnerships”. Adrian also commented that in their industry ‘trust’ is an essential aspect of creating this relationship, and they believed that investing in and implementing the ISO 27001 “was the right thing to do” for their clients. Having had the standard in place now for 4 years, Adrian described the system as “business as usual for us”. “The management system has further embedded Information Security processes in to what we do and has formalised our processes”. The standard has also opened up new markets and presented new opportunities for the company. In the last year the standard has also helped Cypher Media to win a big client over in North America. The client had a stringent procedure regarding information security that Cypher Media needed to demonstrate they could comply to. Having the ISO 27001 system in place meant that Cypher Media could straight away fulfil these requirements laid out by the client. They were able to gain the client as a result of the policies and procedures already in place in the organisation thanks to the standard. Internally, the team are all familiar with the standard and work to its guidelines as day to day business procedure. The scope of the system has also helped Cypher Media to create practises that are “more defined” for backups and recovery, and simplified many of their processes. For Cypher Media the ISO 27001 system proves and emphasises their professional manner, while giving the business confidence with existing and compliance for new customers. Adrian had some great advice for companies who might be considering implementing an ISO standard or those in their early days. Adrian commented on the importance of learning the significance of the standard and knowing “it’s not just a tick box exercise”. Adrian also advised that you shouldn’t be scared to challenge parts of the business or even the standard by examining if they fit in with what you are trying to achieve. When asked about our services, Adrian told us that he liked our approach and our friendly service. He also mentioned his positive experiences with our auditors and that he liked the mix of industry experience on offer from our auditing team. For more information regarding the ISO 27001 Information Security Management System, please click here.